Shuchi Marketing Services established in 1997 promoted by Mrs. Shuchi Malik CEO of Company. The proverb a sound mind in a sound body can aptly be termed in conjunction with making of society healthy with idea of providing complete hygiene and health to mankind, is the aim behind establishing a Pressure Cooker Manufacturing unit. Shuchi Marketing Services is sister concern of Mis Libraw Pharma an 150-9001:2000 certified company catering to next generation pharmaceutical industry needs. Safety Valve is an important part of the pressure cooker.The Alloy Composition of safety valve shall be Such that it melts before gauge pressure is reached greater than half of the bursting pressure i.e. 3 kgs. per sq. cm. The weight of safety valve is 15/16 gms.as per I.S.-2347. Pressure Regulating Device (vent wt),is made of brass and stainless steel conforming with I.S.I standard. Thickness of chrome plate is I.S.-1068. Vent Tube the material used is nickel chrome plated brass conforming I.S.I. Standards with S.S. Bush Inserted. Vent seal pin for pressure regulating device is made of stainless steel conforming with I.S.-6527. Locking Loop is made out of pure stainless steel conforming to SAIL Standard. Lid Handle Bars are purchased from leading manufacturers conforming with I.S.I. Cover Head is made of aluminium extrusion of leading extrusion manufactures. Stud & Screw is made of brass rod. Aluminium body made of wrought Aluminium conforming with IS-21. Bakelite Main Handle, Bakelite Lid Handle,Auxiliary Handle are made from impact resistant and non-inflammable plastic as per I.S.-13395. Aluminium Main Handle is made from aluminium alloy checked lotwise in our laboratory and as well as independent laboratory. Shuchi Marketing Services future vision is to offer quality Pressure Cooker by the Brand name "Stellar~" being fast moving consumer good, globally meeting all national and international standards. We have started Exporting Pressure Cooker to neighbouring countries and also exported to Europe, Middle East, South America and South Africa. Shuchi Marketing Services observes strict quality control and good manufacturing practices norms to produce top quality "Stellar@1I brand of pressure cooker with aim of achieving the final product. v The happy customer. Strict quality controls are observed at each stage of anufacturing and in process check also done. · Excellent product without compromising on quality with low cost. · Has life long non fusible safety pressure release device. 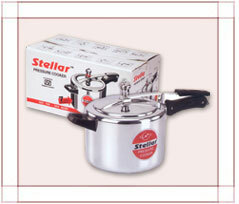 SteIlar@ Pressure Cooker comes in two specifications in inner lid i.e. BG Body, 14G Lid and lOG Body, 14G Lid and in outer lid BG Body, lOG Lid with 55 screws / locking loop, brass / 55 pressure weight, 151 marked gasket and bakeIite handles. We can make as per in house specification of customer also. The company has a robust infrastructure to innovate and create top quality Pressure Cookers and Pressure Cooker . The work force of the company is well experienced and technically sound. Keeping in mind the nature of our product, top quality is always given priority. Our Pressure Cooker and Pressure Cooker Parts are manufactured as per ISI Specifications. There is a separate quality control department that follows a comprehensive quality control schedule, which results in negligible batch to batch variation. Further the pressure cookers are tested under rigorous conditions to make your safety, a surety. Our plant has a capacity to manufacture approximately 10,000 pressure cookers a month. We look forward to having a fruitful long term business relationship with you. If you are interested in installing pressure cooker plants, we can provide you the technical know-how on turnkey projects. You can also contact us for Distributorship of our Products.